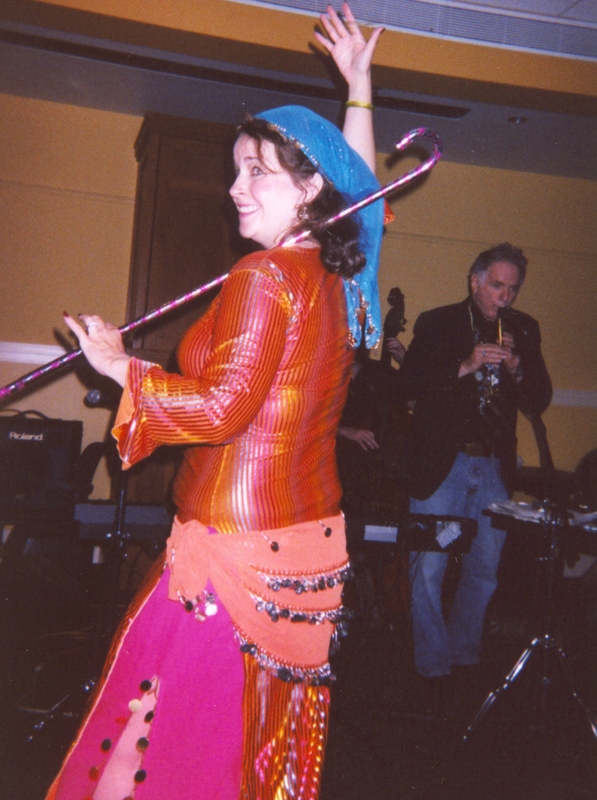 With David Amram Trio, Lowell, Mass., 2007. Here I offer some answers to common questions about Oriental dance, about questions I have received about my own dance career. I consider myself a lifelong student of Oriental dance, so my knowledge is always growing, too. When I learn something I hope will add to your understanding and love of this dance form, I will add it here. Why does this dance have so many names -- Oriental dance, belly dance? Is there a correct name? Belly dance is probably the term you hear most to describe Oriental dance. It comes from a turn-of-the-century promoter, catering to western audiences' idea of the 'exotic' east. While in common use both in the west and even sometimes in the Middle East, the term is not totally accurate. I personally will not take offense if you refer to my dance as belly dance. But in general I call it Oriental Dance, which comes from the Arabic, raqs sharqi, meaning dance of the East. It's called Oriental Dance because it has come to embrace the gestures and styles of many eastern cultures. It's really not about showing the belly, even with the two piece costume :) it's a dance that involves a range of movement and expression of the whole body and personality. Where did this dance come from? Here's the short answer :) Oriental Dance is at heart a folk dance, and so no one knows for sure where it came from. We do know dance has a long history in the cultures of the Middle East; just look at famous images from ancient Egypt, Assyria and Babylon and it's clear. Dance has traditionally held both secular and religious meaning; many beautiful passages about dance appear in the books of The Old Testament including Exodus and the Song of Songs. What types of occasions call for Oriental Dance performance? Ask any Oriental dancer this question and we will say, any time! I dance at weddings, birthday parties, graduations, retirements, ethnic folk festivals and more. It's a dance of celebration intended to add to the joy of the occasion. Uh, there is no stripping involved, is there? I add this because it's a fair question given that many people, especially outside Middle Eastern culture, get Oriental Dance confused with burlesque. The short answer is, no, we don't strip. Professional strippers sometimes start their show dressed as Oriental dancers, but they may also start their shows dressed as nurses, secretaries or school girls -- but that does not mean they are any of these things -- it's just part of their act. You will probably see an Oriental dancer enter with a veil that she later discards, but this is not intended as strip tease. The veil is a way to make an entrance and to add beauty and grace to the performance. Why do some people put money on the dancers' costume? This is an old custom to show appreciation for a dancer, but it is not practiced everywhere. Many venues such as night clubs encourage patrons to put money discreetly on a dancer's costume as she makes her rounds to the customers' tables. Some venues prefer it be placed on her head or even in a basket. If you are not sure, ask the management or ask the dancer. If you tip the dancer by putting money on her costume, please always show respect by using discretion and good taste so as not to offend the dancer or other patrons. I went to a Middle Eastern restaurant and the people started making this shrill noise when the dancer performed. What was that? It's called a 'zaghareet,' and it's a ululation made to express joy and appreciation at any celebration. Recently, while in Egypt, I attended a wedding for a friend's niece in a Coptic Christian church. The entire church was filled with the sound of zaghareet, along with the chanting invocations of the priest. A truly exquisite symphony of joy for this young couple. What are those metal things on the dancers' fingers called? They are finger cymbals, also called 'zagat' in Arabic and 'zills' in Turkish. They're usually made of brass and probably date back to the origins of the dance itself. They're part of a family of hand-held percussion instruments in eastern classical and folk music. Please do not call them "clackers!" Where do you get the costumes? Some of my costumes are custom-made by the talented designers listed on my Links page. Some are from respected vendors, and a few I bought in Egypt. I even bought a costume at a mall -- the City Stars Mall in Cairo. Some dance scholars think it comes by way of the influence of Orientalist painters and writers who had a somewhat distorted notion of life in the East. That said, many public dancers in India and Pacific Asia do have two piece costumes, so there may be an authentic connection. Either way, the two-piece costume, also called a bedleh (from the Arabic word for "suit") isn't the only type. There are one piece dresses known as beledi dresses, usually for a more folkloric style of performance; there are also fashionable gown-style costumes. These are just some of the many styles, depending on the variation of Oriental or the imagination of the costume designer. Sounds complicated. What type of costume should a dancer wear? That depends on the occasion, the variety of dance, and the traditions, the practices and the religious sensibilities of the region where the dance is performed. In Egypt, dancers performing in public are required to cover their midrifts and either wear a mesh stocking or a costume that does not expose the midrift. Is this dance hard to do? It took me and most dancers I know several years of study and practice to prepare to public performance. But, I do believe anyone who is dedicated can master Oriental Dance, whether as a professional performer, or simply for fitness or fun. It is my dream to keep learning, because that is part of being a professional in any endeavor and because there is always something new to discover and celebrate in Oriental Dance. Morgana, I heard you are really Irish. Am I ever. My mother is from Ireland, my father is from an Irish-American family in Boston. My choosing the dance name "Morgana" is both from phrase, Fata Morgana (mirage) and in homage to my heritage (it is the name of an Irish goddess.) One of the most beautiful aspects of Oriental Dance is that it has become a world community of dancers from every ethnic and national background, drawn together by a love of this art form. To quote the wonderful Irish film, "The Commitments," It's about soul!